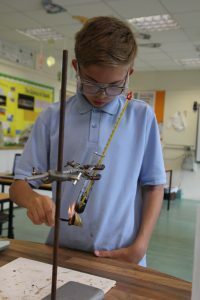 We offer the full National Curriculum for boys from Year 6 to the end of Year 9. A modified curriculum from Key Stage 4 enables pupils to follow GCSE courses in English, Mathematics, Science, RE, PE, Art and Design, Design Technology and valuable pre-vocational courses in Horticulture, Brickwork and Painting and Decorating. St Edward’s provides opportunities for pupils to make progress academically when they may have previously been excluded and without education as a consequence of their behaviour difficulties in other settings. Courses leading to BTec qualifications in courses such as Outdoor Education, Skills for Independent Living and Hospitality and Catering are offered in Year 12, combined with work experience day release placements tailored to meet pupils’ personal preferences and interests. A range of educational field trips supplements the curriculum at all age levels, enabling pupils to pursue curriculum interests beyond the classroom. All our pupils follow learning programmes in Personal, Social and Health Education (PSHE) and in the acquisition of valuable social and communication skills. Boys can attain a wide array of school-based accreditations and awards for participation in numerous pursuits, initiatives and in their subject areas. A positive behaviour system encourages pupils to accumulate points through their work each week in school. Points-related activity programmes encourage boys to seek greater involvement in the wide array of activities on offer. Recent top points activities are featured in Latest News.